Well, this trip went way smoother! 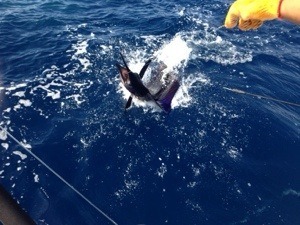 We raised 20 sailfish and ended up releasing 11. Super fun day full of consistent action. We even put a 20 pound dolphin in the boat. Quite a few double headers made things exciting. This is what you come to Costa Rica for! Well, as expected the full moon brought on red hot action here in Los Suenos over the past week. Boats were easily seeing over 30 sails a day, but the past two days numbers have been dwindling as we come off of the moon, and today was almost Rock bottom. 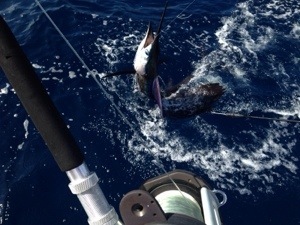 We managed to go 3/5 on Pacific Sailfish. All 5 were hooked, just two unfortunately came unbuttoned. Not super stoked on our day, but we came back to the dock only to see a lot of boats coming back with the skunk, and thank goodness it wasn’t us. Hopefully we can get into some better action out of Quepos on Thursday. We are laying low and doing some ATVing tomorrow and I will probably get a little surfing in while I’m here. Gotta love Costa Rica. I made some changes, actually mostly additions, to this website/fishing blog. I made a lot of changes to every page, especially the “BOATS” PAGE, and added a PHOTO GALLERY, TACKLEBOX PAGE, and CONTACT PAGE. Anyone can contact me at any time through my CONTACT Page with any questions from chartering a boat with me (Captain Ricky Wheeler) to general fishing questions. The TACKLEBOX Page is devoted to How-To Videos, Tackle Talks, and tackle info. What would everyone like to see more of as far as the TACKLEBOX Page goes and also VIDEOS for 2014? After the Gale Warning and freezing spray advisory yesterday, we had a nice break in the weather today to go looking around for some striped bass. Temps were frigid but seas were calm all day. We started out trolling around Cape Henry in 50-70 feet of water where the shipping channels intersect. The water temps were cold at 41 degrees, but there was a ton of bait, a few finback whales, and plenty of gannets diving around us. All the signs were right but the fish just weren’t there. We trolled Mojos and Stretch 30 diving plugs there most of the morning in a small fleet of boats and nobody had a hook up. Around 11:30 am we decided to run out towards the Cheasapeake Bay Light Tower to try for bluefin tuna for a couple of hours, but it was lifeless out there. We spent 2 hours around the CBLT in clean 43 degree water, but there were not any signs of life. With that we ran back inside to get back on the troll for stripers, but there was not much to work in the afternoon as the bait scattered and birds dispersed. Not the start we were hoping for. Hopefully tomorrow will show us some better luck.